But the Skaven do not sit idly by while Tehenhauin plans his crusade. Scenting great Warpstone deposits in the jungles of Lustria, the arch Warlock Engineer Ikit Claw has claimed The Star Tower in the name of Clan Skryre: a staging post from which to delve deep into the continental interior. With the Forbidden Workshop at his disposal, Ikit Claw will bend the raw stuff of chaos into his twisted designs, forging ingenious and cataclysmic weapons… and placing the Warlock Engineer on a collision course with the Prophet of Sotek! You can find the The Doomsayer Update patch notes here, and you can find the master feedback thread here. For full details on all you’ll get in this Lord Pack, head over to Steam to read more (and get 10% off if you pre-order). When will The Prophet & The Warlock be released? The Prophet & The Warlock will be released on Wednesday the 17th of April 2019. A Wednesday, we hear you say? You read correctly! It’s the Good Friday bank holiday here in the UK that week, so to ensure there are developers on hand to address any unforeseen issues we’re releasing a day earlier than usual. Happy Easter! Is there a pre-purchase discount? If purchased through Steam, you’ll get a 10% discount if you pre-order before The Prophet & The Warlock is released – the time is now, yes-yes. Otherwise, please check with your favoured retailer for details. Will the new Legendary Lords be fighting for control of the Vortex? 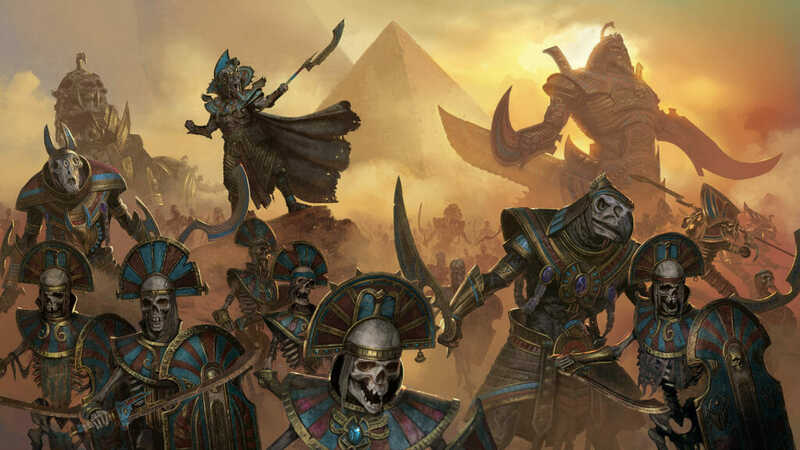 Both Tehenhauin and Ikit will fight for the control of the Great Vortex with their new unique faction mechanics, which can be experienced in both this campaign and Mortal Empires. Will the new Legendary Lords be available in the both the Eye of the Vortex and Mortal Empires Campaign? Yes, The Prophet & The Warlock will be available to play in both the Eye of the Vortex and Mortal Empires Campaign. What new units will be in The Prophet & The Warlock? There will be new units to bolster both the Lizardmen and Skaven lineups. For full information on which specific units, check out The Prophet & The Warlock Steam page. What’s the free content that will be released alongside the DLC? 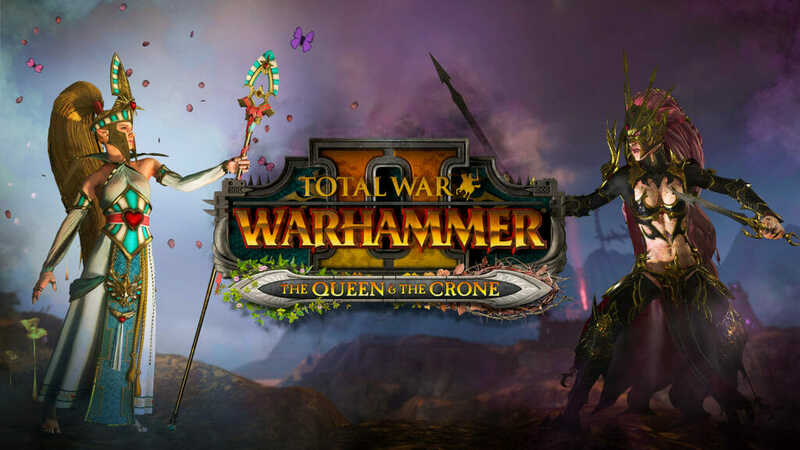 We have a lot of free content in the chamber that will be available to everyone who owns Total War: WARHAMMER II regardless of whether you buy The Prophet & The Warlock or not. 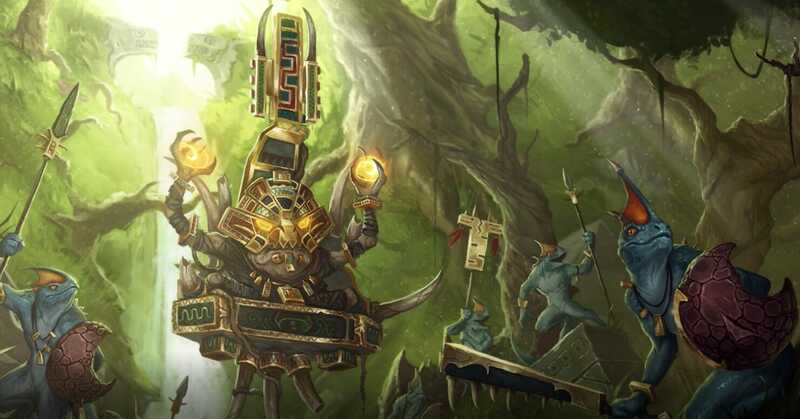 There’s never been a better time to go back and play the game – especially if you’re a Skaven or Lizardman fan. Yes, there will be a new free Legendary Lord to play as, but also coming alongside this DLC will be the Doomsayers Update for all players. 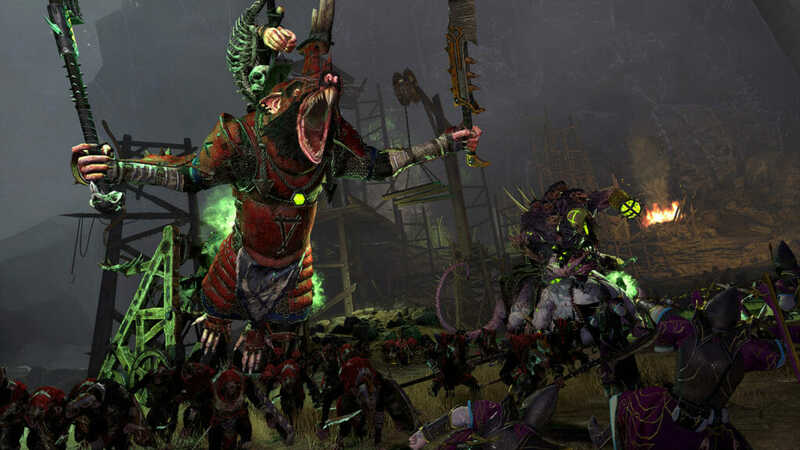 A refresh of the Skaven and Lizardmen factions with an overhaul of Bretonnia in the Mortal Empires Campaign, this update could easily be our most extensive yet. 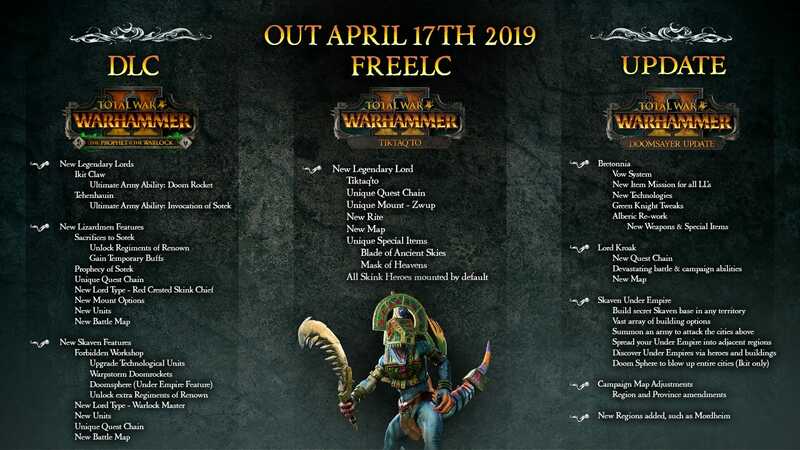 We’ll be getting into all the details soon, but here’s a quick taster of what’s in store for both Bretonnia as well as an insidious new feature, the Skaven Under-Empire. The Under-Empire is a new feature coming to all Skaven Legendary Lords on The Prophet & The Warlock release day. Following the release of the Vampire Coast faction, we saw a lot of fans calling out for something similar for the Skaven – and we listened! The pirate coves mechanic in Curse of the Vampire Coast laid the foundations for this feature, but it’s much more in-depth and allows all Skaven factions to build a secret base of operations known as an Under-City deep beneath any settlement through conquest or the use of agent actions. Once established, a whole host of building options will be available including wealth, resources, and corruption buildings. Under-Cities also support the ability to either summon a verminous army to rise up and attack the settlement above or (if you’re playing as Clan Skyre) to detonate a Doomsphere device which, if not detected, can blow the settlement above to ruins. Remaining hidden is key to developing the Under-Empire to its fullest, but with each addition to the tunnels and warrens the risk of being spotted grows ever greater. If spotted, Under-Cities can of course be destroyed (a little bit of rat poison goes a long way) by those that rule the settlements above ground. Discovering whether a verminous nest lies beneath a settlement can be achieved through the construction of specific buildings, deploying heroes in close proximity to search for the Ratmen, or for the Skaven to blow their cover by building too much. What’s in the free Old World update that will be released alongside the DLC? Bretonnia will be getting a number of updated features. One of these is the Vow system, available to all Bretonnian Legendary Lords, Lords, Prophetesses, and Paladins. Replacing the existing Vow skills, each character will need to pledge themselves to a Vow and undertake a task to demonstrate their devotion. Upon taking up their pledge, the character will receive a trait linked to the conditions of the task, which could be anything from defeating enemies in battle to constructing certain buildings in their home region. Upon completion of the task, the Vow will be granted and the character will be able to progress onto subsequent Vows. Once completed, each Vow will grant the character a selection of buffs and benefits, such as upkeep reduction for specific units, increased armour, or even immortality. When will the free content be available? Also on the release day of the DLC – the 17th of April 2019. Will The Prophet & The Warlock be released on macOS and Linux? This will be coming shortly after the release of The Prophet & The Warlock – stay tuned!